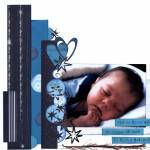 LO created using the gorgeous new Crate papers 'Mia Collection' that Lorraine has just upload into the shop. Beautiful Jan.. this paper is so divine and, as always, you have created a masterpiece with it. Jan she is adorable and i love what you have done.I have these papers and i'm thinking what to do with them they are so preety. Jan, this is gorgeous. I love the effect of the overlay strips and the handcut elements too. You have used these PPs beautifully Jan. The birdie is sweet, and your title "so cute" says it all.